More nutritious than a salad and tastes like a dessert. - If you feel sluggish and need a natural energy boost. - Or if you just want to loose some lbs. *DOCTOR RECOMMENDED - For a better quality of LIFE! It is an EFFECTIVE way to help you LOSE WEIGHT, INCREASE ENERGY, and get your daily dose of NUTRITION. Shakeology can help you reduce cravings, as well as promote healthy digestion and regularity. It is recomended that you replace one meal per day with a shake, along with regular exercise and a balanced diet. It can Reduce: your total cholesterol, LDL cholesterol, cardiovascular risk, and oxidative damage caused by free radicals. Shakeology is a quick and convenient way to get daily complete nutrition. It supplies me with the energy I need to get through the day and it is convenient. It is an excellent way to eat healthy when having a full meal is not possible. I keep a packet in my car and purse at all times so I am never stuck without a nutritious meal! Also, if you don't like eating fruits and vegetables then this is a great way to get all the benefits of a full bowl of fruits and vegetables without having to actually eat them! Mix 1 scoop of Shakeology with 8 oz. of water (ice optional). Or if you want something more filling and maybe even more satisfying, blend your Shakeology with ice and nonfat, almond, rice, coconut or soy milk, or even juice. Shakeology dissolves easily, but blending it will give it a thicker, creamier texture. Feel free to add more than 8 ounces of liquid if you think it's too thick. The more liquid you add the thinner it gets! Play around with different recipes to figure out how you like it best! It's super easy and allows you to find just the right recipes for YOU! Check out my Shakeology website for more information and to purchase Shakeology. 1. Message me for a sample: Chocolate, Greenberry, Vanilla, Strawberry, or Tropical. 4. You can sign up for Shakeology HD (home direct) which gives you reduced shipping and automatically ships your Shakes to you each month. You can cancel at any time with no questions asked. There is also a 30 day money back bottom of the bag guarantee. If for any reason you do not like the shake you can return the empty bag for a full refund. 5. 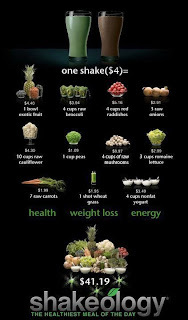 You can purchase Shakeology in the bag or 24 individual serving sizes, both are the same price. With individual serving sizes you can have an assortment of Greenberry and Chocolate, Chocolate and Vanilla, Vegan Tropical Strawberry and Vegan Chocolate, and the new trio box of Chocolate, Vanilla, and Strawberry. What do you get for your purchase of Shakeology HD? A month's supply of shakeology. A calendar of 30 different ways to make each flavor. Reduced shipping when you sign up for Home Direct. A spot in my Challenge Group! For MORE information or to ORDER CLICK HERE!